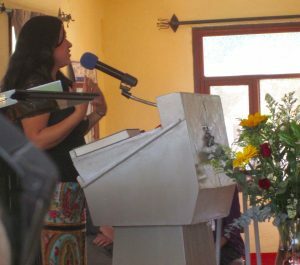 The topic “The Power of Writing to Heal and Transform” drew an overflowing crowd at the Unitarian Universalist Fellowship here in San Miguel de Allende last Sunday. 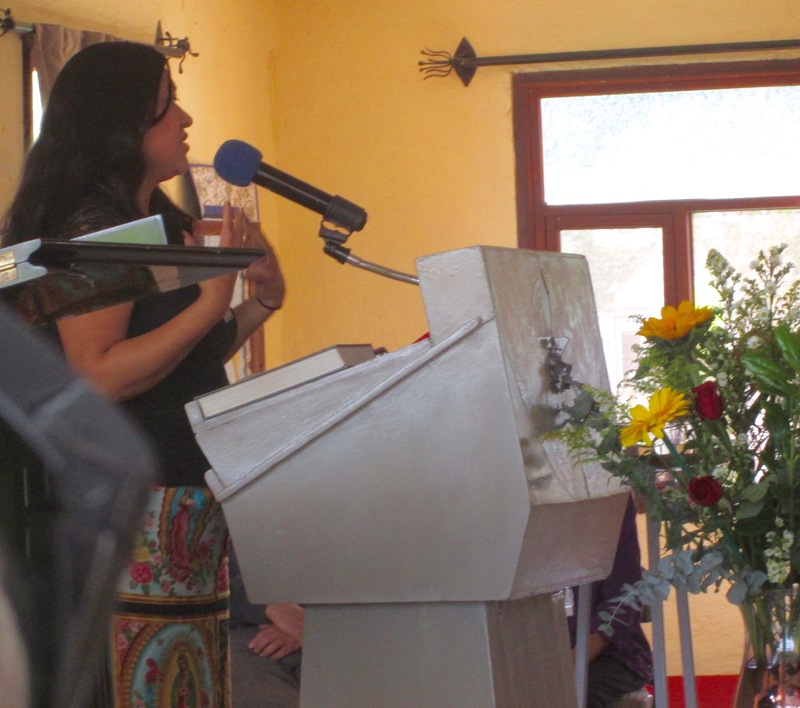 Award-winning author Reyna Grande — whose bestselling memoir, The Distance Between Us (Simon & Schuster, 2012), which recounts her life before and after coming from southern Mexico to Los Angeles as a young undocumented immigrant – was the guest speaker at this UU service. Her newest memoir, A Dream Called Home, on becoming a writer, has just been released. Grande’s message clearly struck a chord. “Writing is a way to disinfect wounds,” she said. “Confronting difficult truths and putting them into words on paper provides a path toward healing.” As I sat and listened to her, taking notes and sneaking a photo from the sidelines where I sat in the UU congregation, I reflected on my own writing life: Writing has not only transformed me, it has saved my life. Grande illustrated her inspirational talk with stories. One was particularly memorable because it was so graphic: Her parents left Mexico for the States when she was a little girl, leaving her and her two older siblings in the care of a “cruel abuela” (grandmother), whose name (coincidentally?) was Evila. When Grande was nearly ten, her father returned and smuggled the children across the border. Many years later, on a visit to Mexico as a grown woman, Grande sat by her grandmother Evila’s bedside as she lay dying. The old woman, delirious, seeming to be plucking at her own skin and shouting “gusanos!” (maggots). Grande subsequently learned that when her grandmother Evila was a little girl she’d been gravely wounded; her parents were too poor to afford a doctor, and her wounds had become infected with maggots. In my own case, early on, when I was writing my first memoir, Somewhere Child (Viking Press, 1981), the experience was more like driving out demons than plucking maggots. But the healing effect was the same. I was 34, divorced, and living on the Upper West Side of Manhattan, not far from Columbia University, from which I’d recently graduated. My daughter, my only child, had been missing for many years. (She’d been abducted by her father.) The pain of this loss, and my powerlessness in finding my missing child, had finally brought me to this precipice: I would either take my life or give it. I decided to give my life in the form of a book. Viking Press, miraculously, made this possible. “I live alone in a small room without a kitchen; in a city to which people from all over the country come to escape tradition’s trappings, such as Home and Family; in a neighborhood where the word “mother” is half of an epithet. I am both a citizen and a foreigner here. “I live alone with memories I cannot forget, memories too painful to speak of, so I do not speak of them. Yet like demons they scream for release, threatening to drive me mad or kill me if I don’t drive them out first. Some time after the publication of Somewhere Child, I learned, indirectly, that it had been instrumental in the creation of the National Center for Missing and Exploited Children. This book not only saved and transformed my life, it helped (I was told) to change laws and raise consciousness about the issues of child snatching and parental alienation. Is it any wonder, then, that in my writing career – as both a writer and a writing instructor – I’ve become something of a missionary for the craft? I’m not the first, of course, to devoutly profess this: Writing saves. Reyna Grande’s memoir, The Distance Between Us, was a National Book Critics Circle Award finalist. Her previous books include the novels Across a Hundred Mountains, winner of a 2007 American Book Award, and Dancing with Butterflies. For more, including several YouTube interviews, please visit www.ReynaGrande.com. Somewhere Child is now available as an eBook. For more about this book, please visit www.bonnieleeblack.com and scroll to the bottom of the home page.